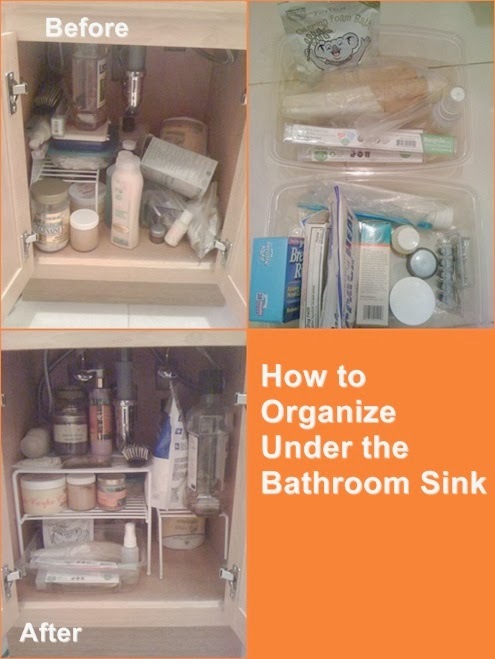 A reader requested ideas for organizing under the sink. I figured I'd share actual photos of the tiny under sink cupboard my boyfriend and I shared in our wee Brooklyn bathroom. If that space can be organized anything can! You can find these shelves on Amazon and in the kitchen section of The Container Store and Bed Bath and Beyond. Measure your cabinet taking into account any pipes under the sink to make smart choices about which shelves to buy. Also consider the variety of heights of containers you need to store. You can see from the photo that I have a single and double shelf in this cabinet. I reused salad greens containers to create little bins that make it easy to pull out groups of items. This keeps me from having to move a million smaller containers and boxes to reach whatever I am looking for. This also prevents things from piling up. Don't be afraid to repackage products into jars, bins, and bags that work better with your organizational method too. For example, I keep my cotton swabs and pads together in a sandwich container. Don't feel like you need to store everything you use in the bathroom in the bathroom, especially if your space is small. Keep back stock of toilet paper and hair products in another room. Or better yet, don't buy any until you almost run out. When we lived in Brooklyn, land of 24-hour bodegas, one spare roll of toilet paper was plenty. Also, do not keep more than one trial or single use size anything per person in your house for longer than a month. They will pile up to become space hogs if you don't. (Yes, two hotel sized bottles of shampoo, though they may be from different hotels, count as more than one of the same item.) Stored those you do keep packed away in your overnight cosmetics bag, which you should keep in your suitcase instead of in the bathroom. Do you have any tips for organizing under the bathroom sink? What's working really well in your home?